Do you need near real-time GPS tracking for persons or property such as drones, baggage or other valuables in transit or anything that moves and you need to keep an eye-on? 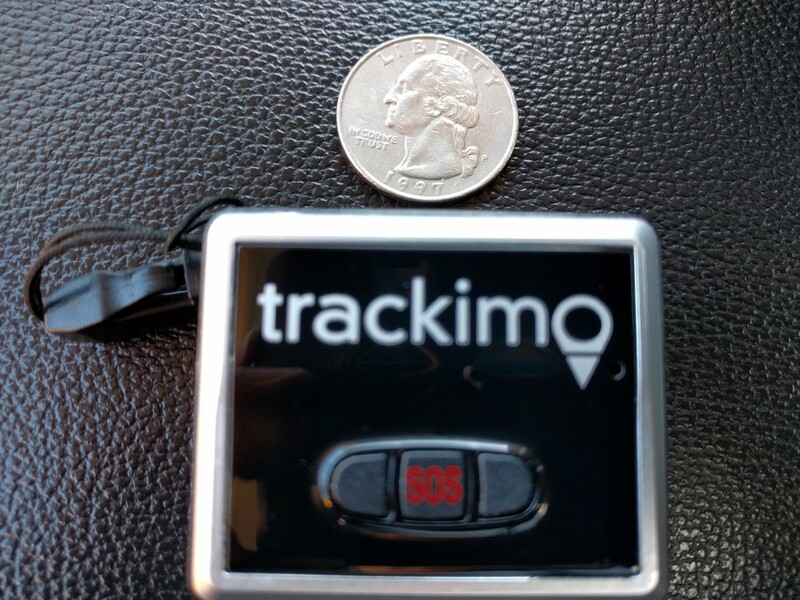 The Trackimo GPS tracker can be purchased as low as $99 /for 1-year free tracking or $139 new from their website. The device allows you to view it’s gps position and offers alerts and geofencing capabilities. The device is a compact small size unit weighing in oat 1.4oz and has a battery life of up to 4 days (when on 120min update frequency), so it can being carried on a wide variety vehicles , people or pets. The Trackimo device is 1.4 ounces, silver and black plastic encased GPS tracker with a GSM (3G SIM AT&T network) module for reporting positions. 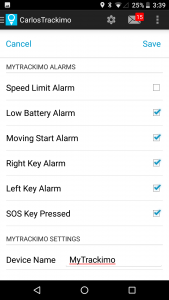 Trackimo has two buttons on the front, called left key and right key; you can use the to send out custom messages when you press and hold either button, plus a center SOS button which you can configure to alert email/sms distribution list. All message setup and other tracking information is setup through Trackimo.com or the associated Adnroid/iPhone App. 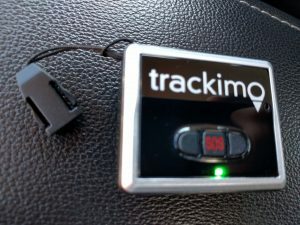 Using the trackimo is pretty straight forward. First you charge the included li-ion battery fully, then power on the device (pressing the red power button), two blue lights followed by a green will indicating its communicating with with GSM network (they use AT&T 3G network for their data connection). Then you need to Register it on their website, using the unique ID code (found on the inside sticker of the device). Once you register the device and it confirms that the device is communicating with itself properly, you can then place the device outside with an unobstructed view of the sky and wait about 10-15min to acquire the GPS signals and fix its position. It then reports this position via the GSM radio back which you can view on their websites dashboard or companion mobile app. The device typically comes with the first year FREE , afterwards subscription (for the data service portion) is $5/month as of 2017 . 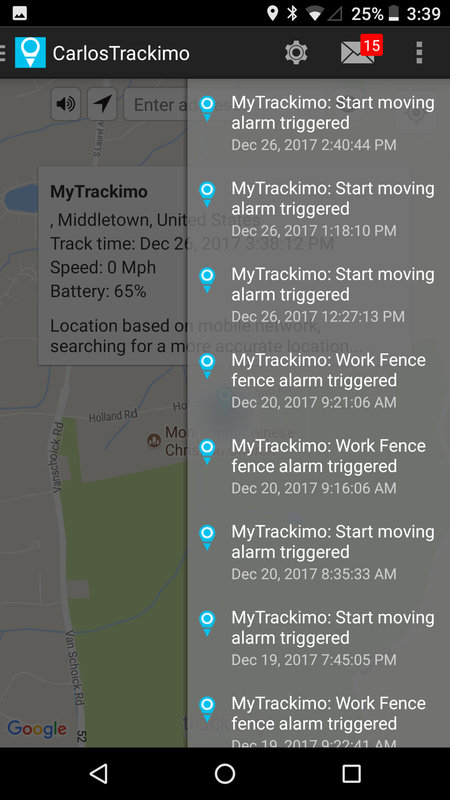 Using the website you can also set-up a geo-fence so trackimo can send you an alert (typically via email) when the device enters or leaves the rectangular geo-fenced area..You can also enable various other alerts such as when the device begins moving , speed alerts or when the device’s battery is low. There’s also an option to control the position reporting frequency, from as quickly as 1-minute (heavy battery usage) to as slowly as 120 minutes (2-hours) (light battery use). 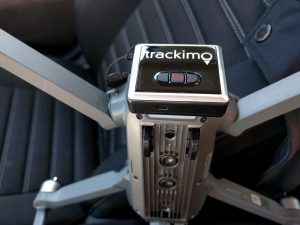 Trackimo is a pretty good solution when tracking things like drones or other property that you need to track on occasion (like a shipping container, or baggage or other valuables in transit). It would be remiss of me if I did not mention that you can also use this to eavesdrop or surreptitiously track vehicles or people (track a cheating spouse) or packages during transport , note that tracking for spying purposes is a bit of legal gray area even for private investigators. 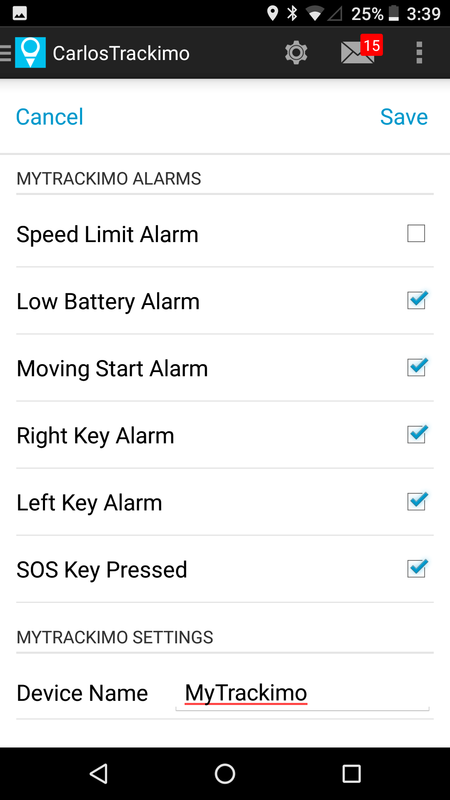 Essentially if you need to track something for up to 4 days, and can easily control when it gets turned on and turned off then Trackimo does what it claims, pretty well. 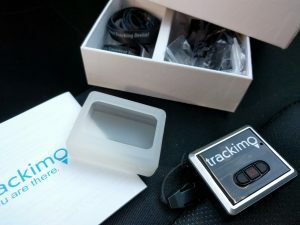 Trackimo comes with a lanyard, a belt clip and a silicone case that allows you to tie it to backpacks, or place in purses or even on footwear. It’s marketed as a valuable piece of mind for those folks that you want to keep track of such as children, pets or elderly. I originally purchased it for my aunt to help track my uncle who has dementia and occasionally gets misplaced while walking. While it works pretty well and even after getting the elderly used to carrying it and using the app to view the track, I found that the 4-day battery was pretty limiting. I kept getting calls as to why it wasn’t working, in almost all cases it was that the battery died and was not charged , eventually after a few month they stopped using it, since the two times they needed to actually find my uncle the device failed because it was depleted. The hassle of near constant re-charges limited its practicality. You’ll encounter this same issue if you’re trying to track kids or pets, you’ll need to be religious about charging it. Until a longer battery (say 30day) or long-range wireless charging is common place i think for tracking people on a regular basis this device has limited practicality. As I mentioned about the biggest drawback of Trackimo (and pretty much every device in this category ) is the power consumption and poor battery life. 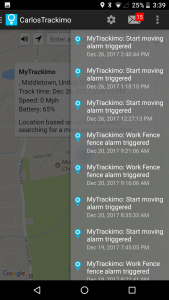 Trackimo claims from 48 (2-days)-96 hours (4-days) , you can control how much the battery lasts by setting the update frequency via the website or the app. The issue here is that even at its slowest update frequency 120 minutes (every 2 hours) which should give you four days, it requires that you charge it at least 8 x a month, and at its most aggressive setting 1 minute frequency you barely get more than a day. So while this is in line with other similar trackers it’s not really practical for uses of unattended operation. Since you need to keep it charged otherwise its just an expensive pendant. In fairness they do provide low battery alerts, so you at least know when its time to re-charge the device. Another drawback is that the device only works within the USA , because the SIM card is only provisioned for North America (uses AT&T network so also check coverage map), that means if you were hoping to use the device while traveling overseas (where it would be really helpful, like tracking baggage or loved ones) ,it will not work since it can’t connect to the local gsm (cellular network) to report data back. This may change in the future as Trackimo may make deals with more international providers, but for now your’re limited to USA only. If you really need international or global tracking , your’re best bet is to use a Satellite based GPS tracker like the SPOT Gen 3 GPS messenger. While it’s not perfect this device is one of the best currently in the category of 3G + gps tracker, in terms of battery life, features and notifications in this category. I think this device (and others in this category) , really have a much more limited practical use for use cases such as regular daily unattended use . I think for tracking devices like drone’s , shipping container’s, baggage, or cheating spouses (check local laws on what’s permissible) , where you can turn it on/off when you need it , it does a pretty decent job . because you can more appropriately control the battery life. For other use cases like long term tracking of pets, kids or the elderly it’s a pretty big hassle, unless your religious about charging it every 4 days. That’s not to say it doesn’t work, its simply the day-today practicality is not up to snuff. So there you have it. Can I track something going cross -country. I’m shipping 3 very valuable packages? Depends on how long it will take, if its more than 4 days, you will likely run our of battery .. Excellent tracker! works decently in tracking my Bike. This serves as one of my security for my bike in case someone tries to steal it, really does the job. Good tracking device, I’ve been using it to track my DJI phantom and works perfectly fine. So I guess I’m getting the same tracker for the same drone you have! Hope this works. I’m a trackimo user and I can say the device is a decent one. The web app is amazing and convenient to use, the device is small and can easily be hidden, perfect for security for my car. 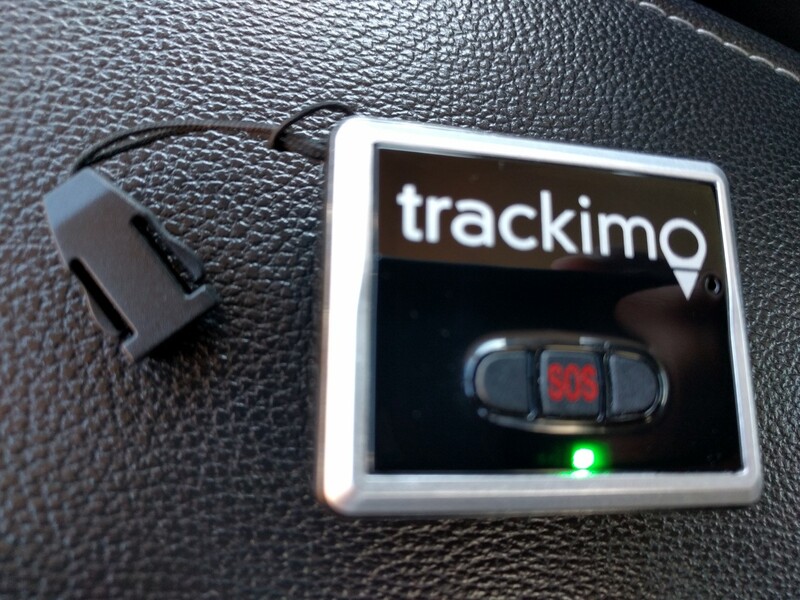 Definitely one of the best in the category of 3G GPS trackers! I have trackimo also and I’m using it for my baby pompom dog. All i can say is “BRAVO”. Very useful and it really damn works! You must check it out guys. This tracker is amazing!I’ve been using Trackimo for my grandma with dementia and it really helps in putting your mind at ease. I’m a trackimo user. I use it for my grandma who has alzheimer’s. It is a very reliable device.